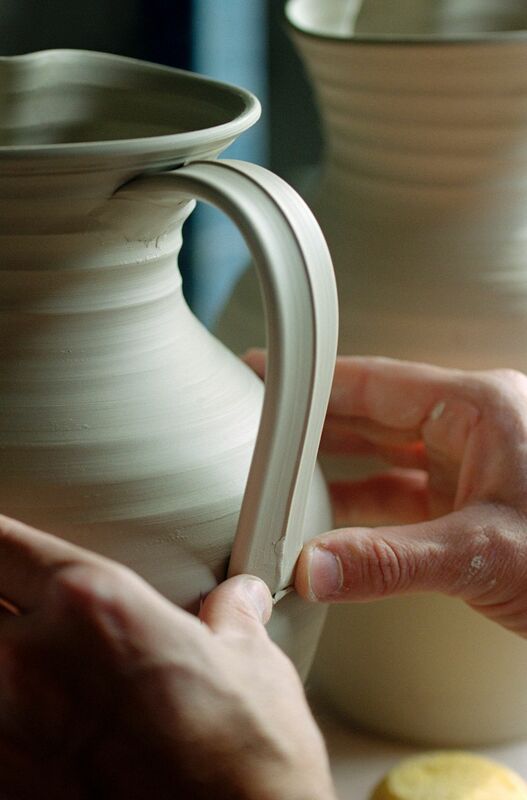 Have you ever heard of pulling a handle for pottery? Many types of pots require handles, including mugs, pitchers, teapots, jugs, and so on. One of the most technically and aesthetically pleasing types of handles are pulled handles. Pulling can take some practice to master, but the results are worth the patience required. Begin by filling a large slop bucket about halfway with water. Set this so that it will be directly below where you will be working. I prefer to pull sitting down, with the bucket between my knees. Wedge two to three pounds of the same clay body the pot that the handle will be attached to is made from. To successfully pull the clay, it must be completely homogeneous in stiffness. 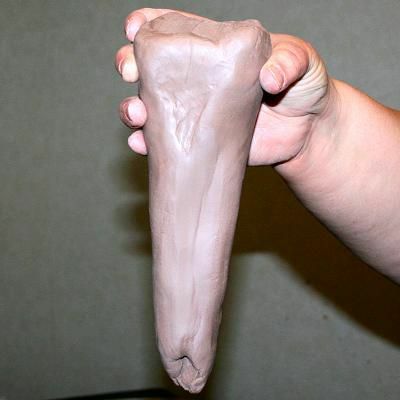 After the clay is fully wedged, pat it into a carrot shape. This carrot is the pulling blank. Grasp the top of the pulling blank in one hand. (I use my right.) Wet the bottom of the blank with the hand that will be working the clay. Keeping your working hand wet, grasp the mid portion of the blank, leaving enough clay above the working hand for a firm grasp on the blank's top. As you grasp the clay, your fingers should be on one side, with your thumb on the opposite side. Fingers and thumb should be flattened as if you were going to make a shadow-puppet duck. With gentle pressure, stroke downward in a smooth, continuous motion. The carrot form of the blank will begin to elongate. Continue elongating the clay with a series of stroking pulls until the clay has reached the desired thickness and at least the minimum length for your handle or strap. Tip: It is good to pull the strap quite a bit longer than you think you may need, especially if you are new to handles. The bow of a handle can take more length than you might expect. Also, if you want to do decorative attachments, the extra length can come in handy. Once you have pulled the clay so that the strap is the right thickness and long enough for your handle, lay the pulling blank over the edge of a table or the bat of the pot that the handle is destined for, allowing the strap to hang over the side. This allows air to circulate around the strap, enabling the clay to dry evenly. Press the heavier top portion of the pulled handle down onto the surface so that it will adhere to the table or bat. Cut the main part of the pulling blank away. Continue pulling handles as needed. Allow the handle to stiffen enough that it can hold a curve without slumping when gently bent. Once the clay has stiffened enough to support itself once bowed for the handle, trim the ends to the correct length. Good cutting tools for this are your potter's needle, a fettling knife, or similar tool. You can either lay the clay strap out on a firm surface, like you see in the photo, or you can trim the clay as it hangs, supporting the clay with your other hand as you cut though. Be sure not to use a sharp tool that can cut you if you trim your clay that way. Handles should be attached when the pot is at medium leather hard and the handle is just stiff enough to hold its curve when attached. Determine where the handle as a whole should be placed. Make certain the handle is directly opposite the spout, if present. The thicker part (if any) of the handle should generally be the upper end of the handle. The top of the handle should be placed as close to the top of the pot as possible. This is both aesthetically pleasing and also gives the pot better balance while it is being used. Score and slip the pot where you want the upper end of the handle to attach. Being certain that the lower end will be directly below the upper, score where you want the lower end to attach. Double check that the line between the two scored areas are perpendicular to the table surface. Attach the upper end of the handle, using firm pressure on the handle and supporting the wall of the pot on the inside. You can usually weld the handle to the scored and slipped area on the pot simply through the firm pressure, but you may also want to reinforce the weld by adding a thin coil of clay around the joint and welding it to both handle and pot. Bow the handle into a pleasing curve. Remember that the clay will shrink up to 15% before it comes out of the glaze firing. Be sure to give the handle plenty of length for a hand to comfortably grasp the handle once completed. Attach the lower end of the handle strap and weld the joint as necessary or desired. Allow the handled pot to dry slowly.